The number of iPhones that consumers traded in for cash payments during this September's iPhone launch jumped more than 50% at the nations leading consumer electronics trade-­in site despite a growing number of alternative programs such as Apple's. iPhone owners last month were more willing than ever to trade in their older devices for top value leading up to  and immediately following  the iPhone 5c and iPhone 5s unveilings, according to Gazelle. The nation's top trade-in service told AppleInsider that iPhone trade-ins for cash payouts during September rose 53% compared to the same period during last September's iPhone 5 launch. When compared to the same period in 2011, trade-ins rose nearly eighteenfold. In particular, Gazelle said it saw four times the trade-ins on the day of the iPhone 5s and 5c launch than it did on the iPhone 5's launch date last year, hitting a peak rate of five offers per second early on the day of Sept. 20. In addition, the average payout from Gazelle per trade-in was $50 higher than in 2012. The company takes the devices it purchases and reconditions or repurposes them for sale in emerging markets or on internet websites like its eBay store. Four times more people traded in their iPhones on the 2013 launch date than did on the 2012 launch of the iPhone 5 The surge in trade-ins may have been driven primarily by users with older iPhone models, as owners of the iPhone 5 appear not to have been as swayed toward upgrading to the incrementally improved iPhone 5s. Roughly 86 percent of iPhones traded in in 2012 were either the iPhone 4 or 4S, while only 66 percent of this year's trade-ins were the iPhone 4S or 5. In the run-up to the new iPhones' release, more users were trading in broken iPhones, which get lower reimbursement but can still defray some of the cost of purchasing a new device. This September, Gazelle says 18 percent of trade-ins were broken iPhones, compared to 11 percent a year ago. This could indicate that owners of broken iPhones were more willing to wait to see what the 5s and 5c offered before deciding to trade in their devices. Our higher trade-in values show an increase of new devices like the... Samsung Galaxy S III and S4  indicating consumers see the iPhone 5s as a worthy upgrade. It wasn't just iPhones that Gazelle users were trading in, either: The company also reported a surge in non-iPhone device trades. "Our higher trade-in values show an increase of new devices like the... Samsung Galaxy S III and S4," said Gazelle's Chief Gadget Officer Anthony Scarsella, "indicating consumers see the iPhone 5s as a worthy upgrade." Gazelle's newest figures reveal that, even after the record-breaking launch of the iPhone 5s and 5c, older models of Apple's handset are holding on to their value just as well. Even with September come and gone, owners of older iPhones can still turn their devices into significant cash. While the iPhone 3G and 3GS  neither of which is supported by Apple any more  net only low double-digit sums, the iPhone 4 can still get $125 for a user depending on condition. The 64GB version of the iPhone 4S, a two-year-old device, can get $210 if it is in flawless condition. Aside from Gazelle, iPhone owners have a wealth of options at their disposal to trade in their devices for cash. First among these in terms of convenience  if not trade-in value  is Apple's own trade-in program. This program runs out of Apple's retail locations, and it can net a customer up to $280 for a top of the line older iPhone model, according to some reports. Apple will not confirm this or any other cash figures, saying that trade-in value depends on a number of factors, but the company has already said that its program is focused more on convenience than maximum trade-in cash. Apple's trade-in program is contingent upon the user signing up for a new two-year contract with Verizon, Sprint, or AT&T. Retail giant Walmart has also launched its own program that allows customers to bring iPhones and other devices into any of its 3,600 Walmart Stores and 500 Sam's Club locations for store credit. Attempts to get exact reimbursement figures from Walmart were unsuccessful, but prior reports had the retailer offering between $50 and $300 in store credit. 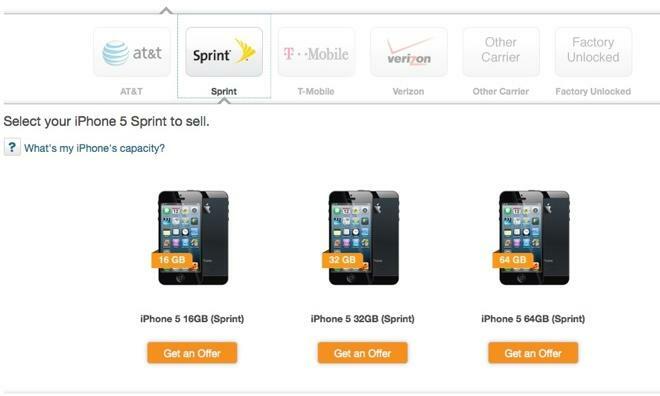 As with Apple's program, customers taking advantage of Walmart's offer must sign up for a new two-year contract with Verizon, Sprint, or AT&T. Customers also have the option of signing up for one of Walmart's pre-paid wireless plans. Amazon also offers a trade-in program, one in which customers can trade in their devices for an Amazon.com Gift card. The program accepts iPhones back through the iPhone 3G, and Amazon will only accept functional devices with light wear. Users can trade in any number of devices up to $1,250, and trade-ins are automatically applied to a customer's Amazon.com account. Radio Shack has also started its own trade-in program for iPhones, paying at least $250 for a working iPhone 5 and $150 for a working iPhone 4S. That retailer also requires that customers buy a new phone with a qualifying two-year plan. Electronics retailer Best Buy has an ongoing gadget trade-in program that assesses the value for a contract mobile phone and then offers an additional $50 if a customer trades in that phone in the store and upgrades as well. Occasionally, Best Buy will also offer iPhone-specific trade-in programs, the last of which offered customers at least 50% off the on-contract purchase price of an iPhone 5 if they brought in a working iPhone 4 or iPhone 4S.